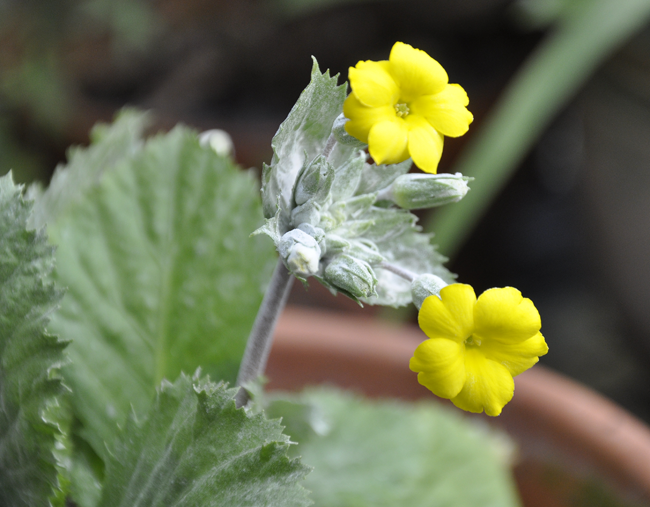 A hybrid Japanese selection of Primula malacoides with wider petals and a more colorul eye. This strain from Sakata Seed, is more floriferous than wild collected seed, but each have their qualities, be they delicate and twiggy, or full of blossoms and fragrant. How about some fragrant primroses to take away some of these winter blues? OK, it’s snowing again today here, a soft, gentle snow, the sort of snow that if this was November, we would be humming Christmas carols and thinking about the Holidays – but it is March, and with night-time temps dipping just below zero (-2 last night), I think we all deserve a little primrose therapy. Here are a few pics of various types of greenhouse primroses that you can try growing in a cool room, or on a winter windowsill in your home. 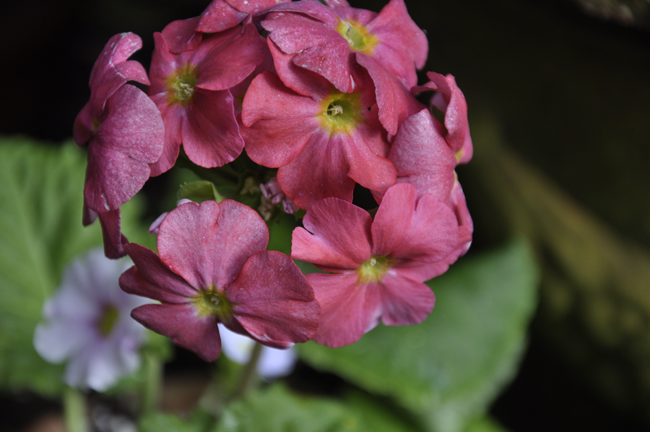 Primula malacoides, the Fairy Primrose, is a seed-raised florist plant, once popular, they are hard to find these days. You may selections like these in my plant window at a good garden center, but below, are some wild species forms that I am raising from seed which tend to be more fragrant. These are closer to the plants one would see in the wild in China, or in a conservatory around 1900, when they were all the rage. 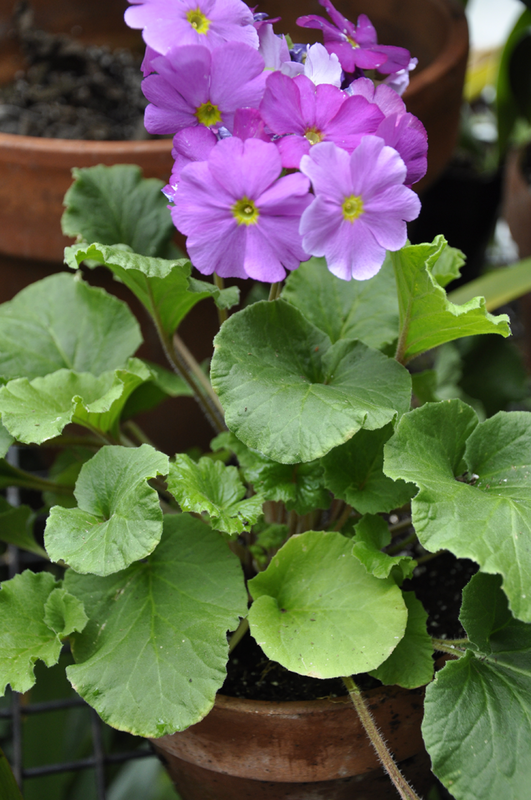 A wild form of Primula malacoides – now starting to put on a show in the cool greenhouse. Plants that I gave away as house gifts in January are actually doing better than the ones in the greenhouse. This is one primrose that really likes to never dry out, even though it doesn’t want to sit in water, it should go partially dry first, and then be watered. You may have fallen for those bright colored primroses often seen at the super market, but I wanted to share with you some more growable ones – some, you can find, at better nurseries, and few, that are a little more difficult to find, but entirely interesting just the same. Primroses can be grouped quite generally into four types (spring, summer, alpine and greenhouse forms) if you don’t wish to become geeky about them (and believe me, there are plenty of folks who can get geeky about the plant family Primulaceae). Look what bloomed today! 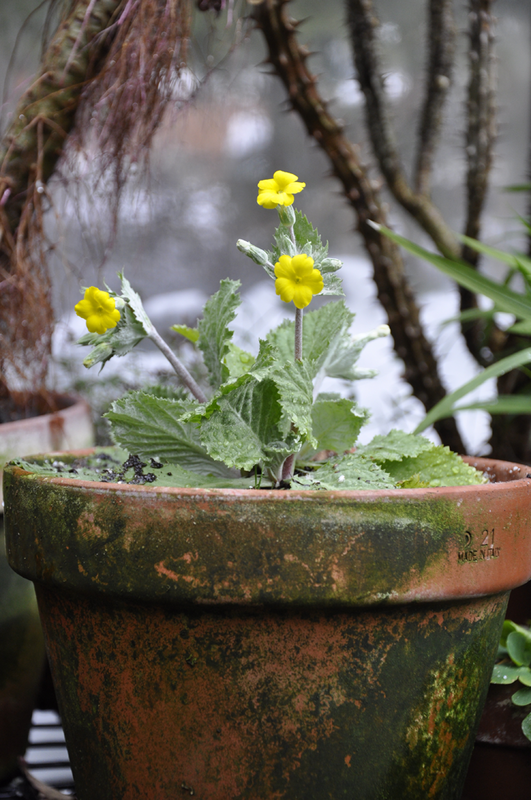 A rarer primrose, the unusual Primula x kewensis, a natural occurring hybrid of Primula verticillata, makes a great windowsill plant, if you can find them. This species is easy enough to raise from seed if you are a capable seed raiser. If not, then search for them at your garden center this spring, as I know of at least one wholesaler who distributed these along with garden primroses last year ( it will not grow well outside). Most primroses choose to bloom in the early spring, just after snow melt if you live in the far north, but then there are those that wait until summer to bloom, generally the sort which like what gardeners call ‘wet feet’, such as the candelabra types including the easy-to-grow Primula japonica, which can line an entire stream with tall whorled stems in July. But I wanted to share with you more details about the winter blooming primroses – most from Asia, and most hybridized by the potted plant industry into interesting selections which are sometimes found at local greenhouses if you are a good plant hunter. Sadly, most are hard to find, as retailers prefer to stock the easier to sell polyanthus types which we all see in bright violet, saffron yellow, brilliant pink and scolding red, with a little rosette of leaves. Yes – these are those little African Violet looking type of primroses which, once you blink, they die from lack of water, never to return. 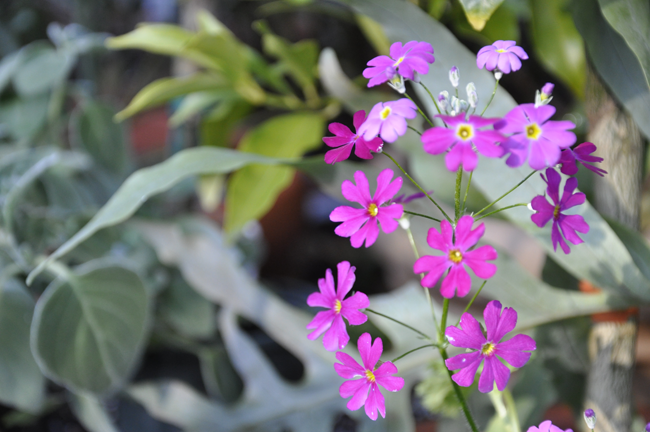 Primula obconica, still in bloom in the greenhouse. This winter blooming primrose has lightly fragrant flowers that come in basically the same color palette as those candy hearts with saying one gets at Valentines Day (except yellow). This periwinkle and citron version, if my fav. I have grown this selections for 30 years – ever since I was in highschool, really. It just says ‘winterspring’ to me. Really. Winterspring. I just made that up. I know that I’ve been over-sharing many of my primrose images of both these seed raised winter blooming types, as well as some of those P. obconica that I purchased at my local market. You should know that each of these winter blooming primroses are far more resilient than those typical sort one sees with bright, low growing flowers in purple, yellow and red, but don’t ever think that any primrose is carefree- the all require attention, for they never wish dry out completely. Just, slightly. Ever….so…slightly. Keep them on your coldest windowsill, and as March progresses, watch the sunshine, as they will burn as the sun brightens. Yes….I promise, it will brighten. Primula obconica dissappeared from the trade for about 20 years because the foliage caused a contact dermatitis ( not uncommon with all primula for people who are sensative to primulin, the chemical in most primula) but this species was particularly irritative. Modern varieties have been bred to have a reduced amount of both primulin, and the micro hairs on the foliage that used to irritate the skin. If you ever are lucky enough to find a Primula x kewensis, buy one and keep it on your window ledge for late winter and spring cheer. The foliage is covered with white farina, which will be nicer when grown inside. In my greenhouse, the hose washed it off every time I water. But the mossy pot sure looks sweet!